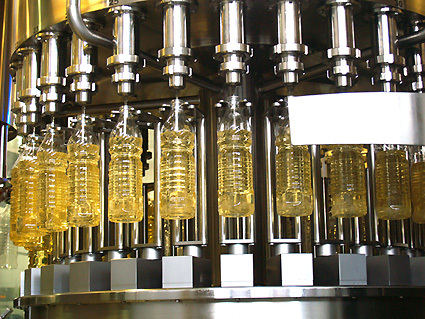 Complete technological line for filling of sunflower oil in 1L and 2L bottles. In August, INDEX-6® installed and put into exploitation a complete technological line for filling of sunflower oil in 1L and 2L bottles, with capacity of 12 000 bph, in the brand new production building of company ZER YAG in Turkey. The line in of synchronous type – the bottles are blown in place from pre-forms and fed from the blowing machine directly to the weight filling tribloc system Pragmatic® 30/30/10 WeightTech, via a complex 38-meter air conveyor path. The tribloc is in Neck Handling edition and comprises a 30-position turret for cleaning of the bottles by blowing them with filtered compressed air, a 30-position weight-dosing filling section and a 10-position capping turret with Pick&Place and a linear cap feeder and elevator. Following the filling tribloc is a multi-lane buffering conveyor system IND-Trans 71/72, ensuring continuous operation with no downtime when changing the labels reel of the Roll-Fed labeler. The bottles are labeled with a single wrap-around OPP label. Final packaging into cardboard boxes in groups of 12 and 20 bottles for 1 L and 8 bottles for 2L is performed by our IND-Pack 24 W manipulator, filling 3 boxes simultaneously per cycle, in combination with machines for box erection and box closing and taping. The maximal complete line capacity is 15 000 bph.